Last Fall I purchased the Windsor Wellington SL from BikesDirect.com and wanted to share my thoughts on the bike. I was looking for something inexpensive to see if I would enjoy road biking. I have had several mountain bikes and hybrids, but wanted to get into more fitness level of riding with my wife. So I went to the LBS and was in a bit of a sticker shock. We did invest about $1100 into my wife's new Road Bike (Specialized Dolce). So the thought of putting another grand on a bike was a little stressful. Which led me to bikesdirect.com. I had been lurking on their site for a few years thinking about their touring models in the past. Anyways, I have read quite a few decent reviews on the Windsor Wellington 2.0 and 3.0. So I was pretty set on getting one of those. I saw that the next level up had a Claris groupset with the brake Integrated Shifters. So I selected the Wellington SL for $499 including shipping. The bike came quickly and was 90% assembled. It did need some tuning. I knew this ahead of time, but for novices out there please take into account when considering cost. The one I received needed both wheels to be trued, front and rear derailer adjustments, and brakes to be adjusted. There was also an issue with the plastic guard that protects the back spokes from the cassette. It was interfering with the largest ring and had to be removed completely. I paid someone locally who does tune ups out of his garage $40 to tune it for me. The frame is just ok. The SL model is a flat black finish which looks pretty decent against the Silver decals. You can see some rough spots around the decals that the clear coat would normally hide. I found the welds to be pretty rough over all. The down tube is bigger in diameter, but there defiantly isn't anything exceptional that stands out with the frame. The Claris group is fine for me. It shifts normally even though its an entry level group. It has a Shimano Claris crank which looks exactly like the Sora one. Where they really skimped was some of the accessories. The seat is really cheap. I am replacing mine. It wasn't godawful but it didn't seem like it would last. The handle bars are really basic. The tape was super cheesey. I have since replaced it with Bontraeger Gel Tape and Gel Inserts from Plant Bike...WOW what a difference in feel. I did reverse the stem for a more upright ride. The wheels are no name. I do suspect that they are fairly heavy. The Kenda tires are fine on the road. They wore quickly in my trainer, but that might be the case with most tires. The Tektro brakes are fine, but the brake pads should be replaced. The pedals are garbage, but you'd most likely replace them anyways. Its hard to tell if the carbon fork makes a difference, but I haven't had any issues. The ride is decent for the price. I can keep up with anyone with fancy bikes. The geometry of the ride is good for me. I am 5' 10" with slightly longer than average legs and I ordered the 56 cm which was a good fit. I could have gone down a size and been fine as well. I do find myself wishing I had better wheelset more than any other components on the bike. 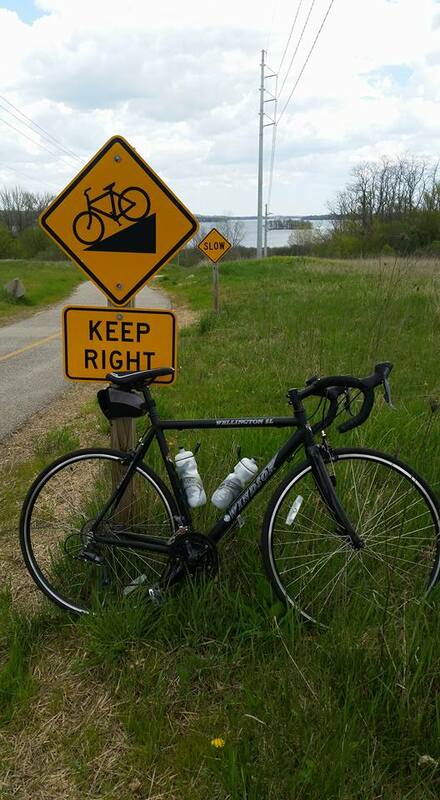 The bike is fairly heavy compared with the entry level Trek 1.1 or Specialized Allez base. I think the wheels and cheaper components really add to the weight. If you are looking for cheap road bike I really would take a step down from this model. The Wellington 4.0 is $100 cheaper and although you get the Tourney groupset, I don't think it will make a big difference to riders at this price point. The 3.0 has the steel fork vs the carbon one. Also the glossy finish on the 4.0 would hide some of the paint imperfections. The extra money on the Wellington SL just isn't worth it for the type of bike you get. You might as well step up to a Fuji, Trek or Specialized for a few bucks more. It sort of is cheaper, but not cheap enough in price to justify the very generic parts that come on the bike. Personally, If I had to do again, I would spend a bit more and get a Trek 1.1 (They have last years model now on clearance for $650 locally) or a Specialized Allez Base. You pay just a bit more and get a much better frame, the Sora groupset, and a better wheelset. With my Wellington, I am going to keep riding it through this year and upgrade when I feel my performance out grows it. Also check out BikeIsland.com for savings on their scratch and dent bikes. I added a cheaper seat from Amazon which was like $15 but is much more comfortable. Another thing to note the seat post doesn't have angle adjustment. So you can see the nose of my seat is too high when I switched it. Another Update if its useful to anyone. I am still riding the bike quite a bit. I can't seem to get over my disappointment on how heavy this bike is. I replaced the seat post with a Nashbar Carbon one, so that I can make an adjustment to the seat angle. The stock seat post was heavy when I took it out! The carbon one is great from Nashbar, I recommend it. Also I decided to upgrade the wheelset and tires. I went with Vuelta Corsa Pro Wheels. I order them also from Nashbar when they had a 25% off sale and got them for about $145. I installed Continental Grand Prix 4000s II tires. They were about $40 ish on sales each. Expensive...but wow what a difference over the stock Kenda tires. The wheelset and tire combo made a a huge difference in handing. They smoothed out the bumps in the road. They really roll and roll down the road. I would like to mention that even with shedding pounds with better, wheels, tires, seat, seat post...the bike is still heavy. That leads me to believe that the frame is very heavy for an Aluminum. I now have about $800 into the bike that I still wish was better. You are better off getting a used Trek, Specialized Giant or Felt. Or even their entry level ones like a Trek 1.1 or Allez Base. 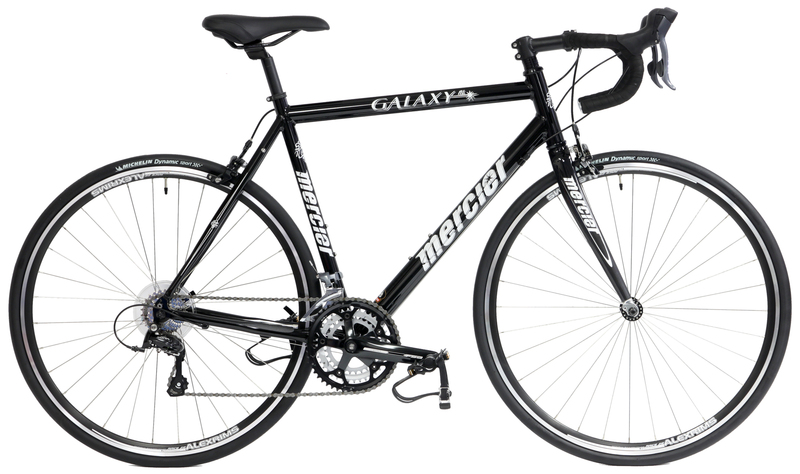 If you only have $400 to spend and are looking at Bikes Direct-- Final Clearance Deals On Road Bikes, Roadbikes - Mercier Galaxy AL Go with this one.